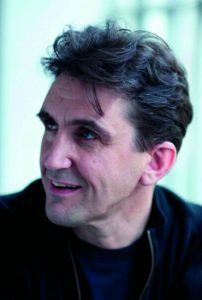 As someone with a passion for British drama I am a massive fan of the McGann brothers and combined with my recent interest in researching my family tree, love of books and excitement about the line-up of this year’s Off The Shelf, the literature and words festival taking place from 7th to 28th October, I was delighted to interview Stephen McGann, currently best known for playing Dr Turner in “Call The Midwife” about his new book “Flesh and Blood”, which I have just finished reading and will admit both made me cry in several places and made me quote passages to my boyfriend. Me: What can we expect from your book “Flesh and Blood” and from your event at this year’s Off The Shelf Festival? Stephen: I guess my book is not the normal kind of autobiography/memoir that you’d expect from a TV actor. That’s because I have other lifelong interests besides drama that have always fascinated me. I wanted to mix these together into a history of my family over the last 150 years. One of my interests is genealogy – the study of family history. Another one is my academic interest the social history of medicine – something which has become more keen by playing Dr Turner in Call the Midwife! So what I’ve written is a history of my family in seven maladies – diseases, ailments or afflictions that have affected us over 150 years, but which have helped drive us on to become the people we are today. It’s a story that blends medicine, social history and the human drama of ordinary people. Me: What are you looking forward to most about coming to Sheffield? Stephen: I’m really looking forward to coming to the Off the Shelf festival in Sheffield! It’s the kind of city I’ve always loved – smart, warm and funny. In particular, I really enjoy getting to talk to people directly about my book. Flesh & Blood is about the fact that everybody owns their history, and every family has a fascinating story to tell. So it’s great to share that face-to-face. Me: Why do you think festivals like Off The Shelf are important? Stephen: The funny thing about books is that there’s isolation at either end of the experience. Writing is a solitary process, but so is reading. So when both sides of that process, the reader and the writer, come together to discuss their shared feelings and responses to a book, I think both sides can come away with something much more precious. Festivals like Off the Shelf are important because they unite a community in the love of words and ideas. Me: What was the most surprising discovery you made whilst researching your family for the book? Stephen: I think it has to be that one of my relatives survived the Titanic!! He got off on one of the most famous lifeboats – and jumped into the sea with none other than the ship’s captain. Me: What advice would you give to someone who wanted to research their own family tree? Stephen: Start by gathering all the information you have from living relatives. However old and frail their memories may be, their personal testimony will be priceless, and help you to piece together the records you find. Then go to your local archive, and ask one of the friendly staff to help you with the first steps. But beware – it gets very addictive! Me: You play a doctor in “Call the Midwife” and your book is focusing on illnesses and injuries, but what if anything makes you squeamish? Stephen: I’m still pretty squeamish about the blood and guts of surgery. But some of the things we’ve covered on Call the Midwife can make the whole cast wince! Last season we showed the effects of a uterine inversion – a woman’s uterus was pulled inside out by a tugged umbilical cord. That was pretty grim! Me: Why do you believe “Call The Midwife” remains so popular and what do you hope the future holds for your character? Stephen: Call the Midwife has a unique relationship with its global viewers based on its portrayal of humanity and community with real sincerity. This success has nothing to do with the period in which it’s set, but comes from the exploration of universal values that viewers recognise in their own lives and aspirations. I hope my character will continue for as long as the drama does. I’m hopeful that Dr Turner will eventually establish a space colony on Mars! Me: You and all of your brothers have had amazing careers but if you could have sneaked on set to play one of their characters for a couple of scenes which of them would you choose? Stephen: Ooh! Interesting. In truth, I wouldn’t dare try and play anything they’ve played, because what they’ve always done is made those parts their own. I love what they all do – and it’s much better to watch with pride from the audience. Me: Finally, what’s coming up next for you? Stephen McGann will be discussing his book Flesh and Blood on Saturday 28th October at 7pm at Sheffield Hallam University’s Pennine Theatre as part of the Off The Shelf Festival and in collaboration with Sheffield Hallam University. Tickets are £8 (£6.50 concession) and are available from www.offtheshelf.org.uk/event/flesh-and-blood-stephen-mcgann. Flesh and Blood is published by Simon & Schuster UK. For further information and to order a copy visit www.simonandschuster.co.uk/books/Flesh-and-Blood/Stephen-McGann/9781471160790.